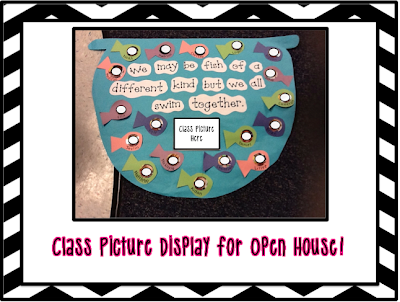 Open house and meet the teacher nights are such an exciting time. I love meeting my new K babies and their parents. 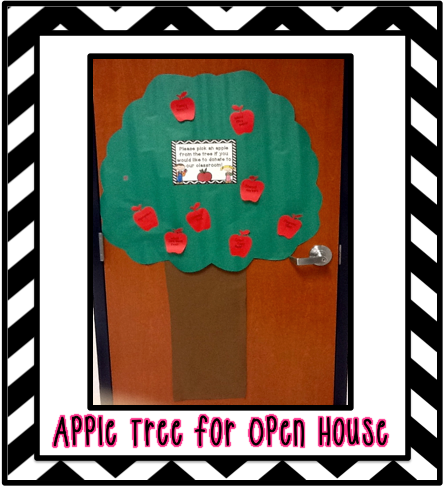 One of the things I do for open house is make an apple tree out of butcher paper. 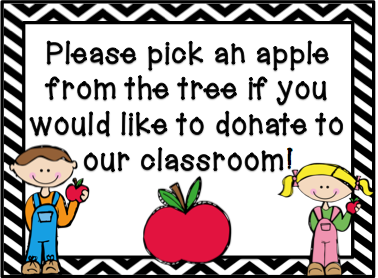 On the tree it says "Please pick an apple from our tree if you want to donate to our classroom." A lot of times during open house parents will ask me what kinds of things I need for the classroom. Since it is such a busy night one of two things always happens. I either forget everything I need or I tell all the parents the same thing! This tree allows the parents to pick something they know that the classroom needs and something that they know they can find! Click here or on the picture to download the sign so you can make an apple tree for your classroom! *Graphics on this document are from graphics from the pond! Also I always make a sign for my door. If the students have been in school I make a sign with their pictures. This year we did not have school before so I just used a sign with their names. This is the sign I used last year. The circles are over the kids pictures! The last thing I do for open house is make sure the kids have something to take home. 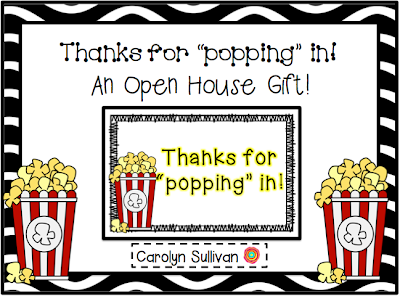 This year I did a "Thanks for popping in!" label on a popcorn bag. The kids loved it and it was simple! If you need labels you can check out the ones below. If you send me an email I will customize them to include your name! !